Review by AllTheBestFights.com: 2016-12-30, good fight between Naoya Inoue and Kohei Kono: it gets three stars. The undefeated world champion in two different weight classes Naoya Inoue entered this fight with a perfect boxing record of 11-0-0 (9 KOs=82%) and he is ranked as the No.4 super flyweight in the world (currently the #1 in this division is Roman Gonzalez). He has fought twice in 2016 winning over David Carmona (=Inoue vs Carmona) and Karoon Jarupianlerd (also known as Petchbarngborn Kokietgym, Inoue vs Jarupianlerd). His opponent, the former WBA super-Flw champion Kohei Kono, has an official record of 32-9-1 (13 knockouts) and he entered as the No.11 in the same weight class. He has also fought twice in 2016 beating Inthanon Sithchamuang (=Kono vs Sithchamuang) and losing to Luis Concepcion (=Concepcion vs Kono). 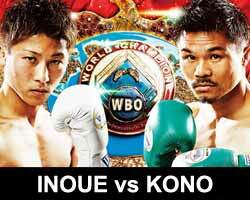 Inoue vs Kono is valid for the WBO World super flyweight title (held by Inoue). Watch the video and rate this fight!